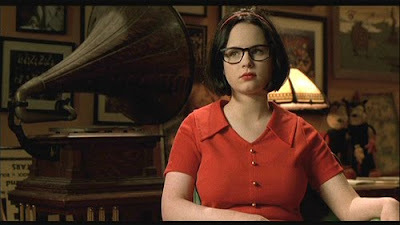 One of my most favourite movies of all time ever is Ghost World - the movie adaptation of Daniel Clowes cult comic about misfit teenager Enid and her best friend Rebecca. There are so many reasons why this movie is a treasured DVD in my collection but take for starters the casting - it is pitch perfect. 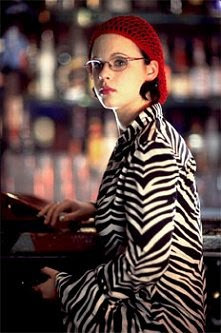 Thora Birch as Enid and Scarlett Johansson as Rebecca are inspired choices for the two alienated yet too-cool-for-school just-graduated best friends but really it's Steve Buscemi as the reclusive Seymour whom Enid befriends which makes the movie. His character is so fully concieved and painfully rendered that at times it's hard to watch. 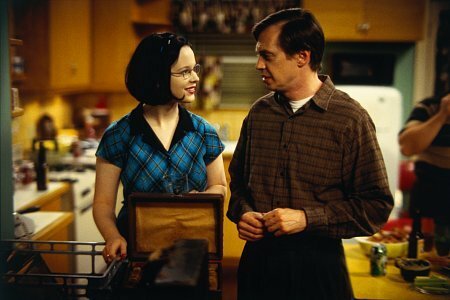 The addition of Illeanna Douglas (totally underated actress), as the hysterical and embarressingly hippie art teacher, is the icing on the cake. But for anyone who appreciates a movie's style as much as it's substance (or even more than!) this movie is heaven from the very first frame. The credits open with the fabulous "Jaan Pehechan Ho" number from a 1965 Bollywood musical "Gumnaam" as Enid gets ready for her graduation ceremony. If this scene, below- an intersperse of the "Jaan Pehechan Ho" number with views into the windows and lives of anonymous inhabitants of the apartment block Enid lives in, as she dances to the video in her tiny room - doesn't get you in I don't know what will. Watch it below and see if you just don't want to hire it immediately. Otherwise I might have to bring my copy around to your house, pop it in your player and sit there watching you expectantly through all my favourite bits. Which I'm told is really off putting. You supply the DVD, I will supply the Tim Tams..
thanks for the review- I will order it and watch it! Just watched the intro - looks fab!! Title wouldn't grab me - not a fan of Ghosty things! But you have me sold. Will try and watch it. Hi Michelle, no ghosts - think title just refers to the aternate /other world Enid inhabits!